The distinctive guitar and voice of STEVE DANIELS filled The Doghouse tonight. 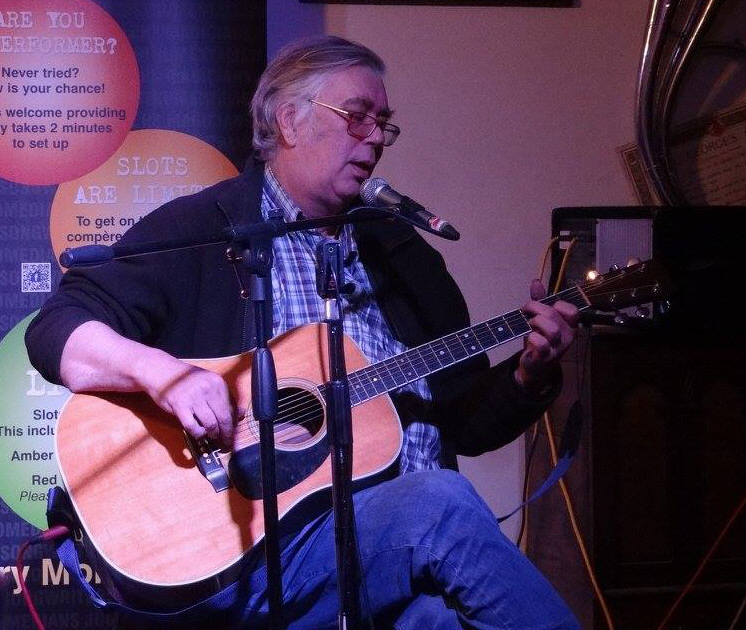 Well-known in Southampton for his deep vocals and blues-influenced original songs, he has performed at various local venues, including The Junction, Talking Heads and The Bent Brief, both solo and with his former band The Beggar’s Choice. He delivered about 75 mins of music, in two sets, joined (as backing guitarist & vocalist) by his good friend GEORGE WILSON. One of my favourite local performers, I can’t recommend him highly enough. They combine most effectively, George’s enviable skills in both melody- and rhythm-guitar styles particularly impressive for standing out even when played at the same register as Steve. Support act were FOCSLE debutants The Mantic Muddlers, getting a longer-than-usual airing. This trio (Lawrence (fiddle, including some extraordinary sounds and subtle energy, & harmony vocal), Jake (banjo / resonator guitar, harmonica, lead vocal) & George (double-bass & harmony vocal) brought us about 30 mins. of mostly original “roots, rattle'n'roll” from darkest Petersfield. We hope they’ll be back as headliners at some point. A paltry-sized audience were treated to two brilliant acts. Many regulars had forewarned that they’d stay away, finding Steve’s material (on rather limited hearing) and style too dark and unrelieved. They would have got a surprise at the variety of pacing, styles of guitar strokes, and genres: their loss. I myself was surprised, but had been perfectly happy for him to have done all blues.